The key word in this lesson is the word “สเปค spec” (please note that the Thai spelling in the subtitle in the video is wrong! I am sorry.). This word is a loan word from English which is believed to come from the word specific (adj.) or specification (n.). 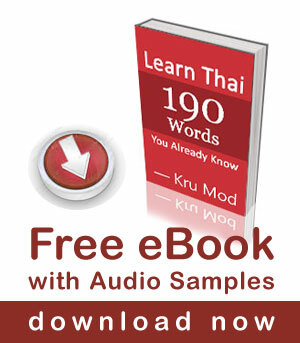 Thai has heavily influenced the forms of colloquial English spoken in Thailand. Yesterday, a guy was flirting with me. Really? How is he like? He is exactly my type. He asked me out for dinner too. Mod: จริงเหรอ /jĭng rĕr?/ Really? My friend will leave the single status soon. Let’s go shopping for some clothes. Hi khun Mod and khun Pear. WOW I am Pears type! 🙂 Good lesson. Great video but too advanced for me. What would be really helpful is to make a video of Mod talking to one of her farrang studentsl. It would be more real and encouraging for me. I know about 400 Thai words but do not have a lot of experience using them in sentences. When two Thais talk everything seems to go by so fast and it is difficult to relate to. The reason I mentioned about Pear English was to help them make a better video. Not to look down on Pear. Though I did say in my first post the video was good. If Chris would like to look back at my first post. What’s the bet Pear speaks English better than Glen speaks Thai? Good video. Easy to understand. But a lot of mistakes in Pears English. Glen, do you mean ‘Pear’s English’? Or plural of ‘Pear’? Just wondering since you commented on the mistakes in English. Great job ladies! I love the transcripts in Thai, Thai phonetics in English characters and English…jing jing na!!! Good lesson, dee mak mak, thank you Pear and Mod, korp kun khrap!